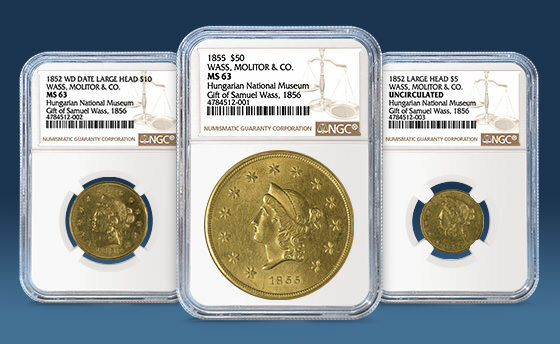 NGC has certified three rare gold coins struck by Wass, Molitor & Co. in the 1850s, during the height of the California Gold Rush. The coins were submitted to NGC’s office in Munich, Germany, by the Hungarian National Museum, which received the coins from Count Samuel Wass. Among the coins is a stunning 1855 $50, now graded NGC MS 63, which ranks as the second-finest example certified by NGC. NGC graded the coins during a recent on-site grading event at its office in Munich — the first such event hosted at that office. The coins were encapsulated in NGC’s special Museum Holders, which were originally developed for the Smithsonian Institution.